I cannot believe it is already time for me to post this month’s Cake Slice Baker’s choice. If you missed last month’s you can still check it out. This month we had to choose from an English Madiera Cake, Haleaka Cake, Blueberry Nut Loaf or Texas Chocolate Muffins. 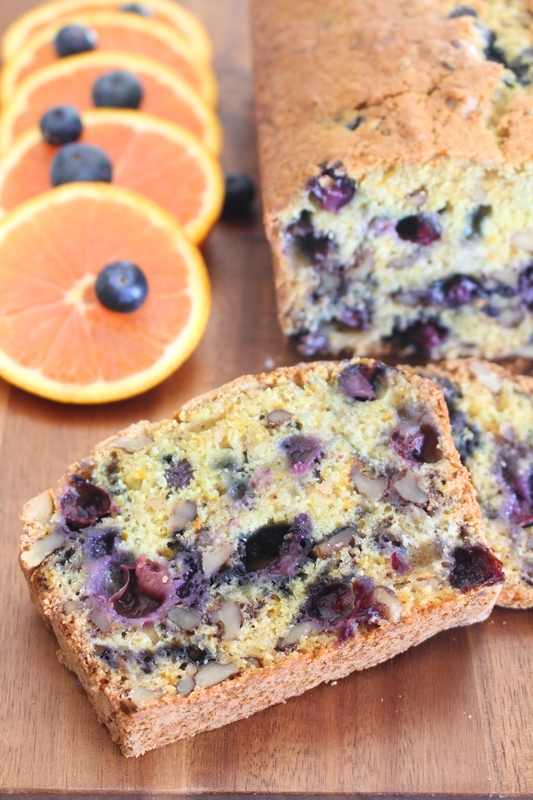 I chose the Blueberry-Nut Loaf Cake because blueberry season is closer now that the days are warm and I cannot wait to go picking. Maida describes this loaf as more of a coffee cake but to me is a delicious quick bread. 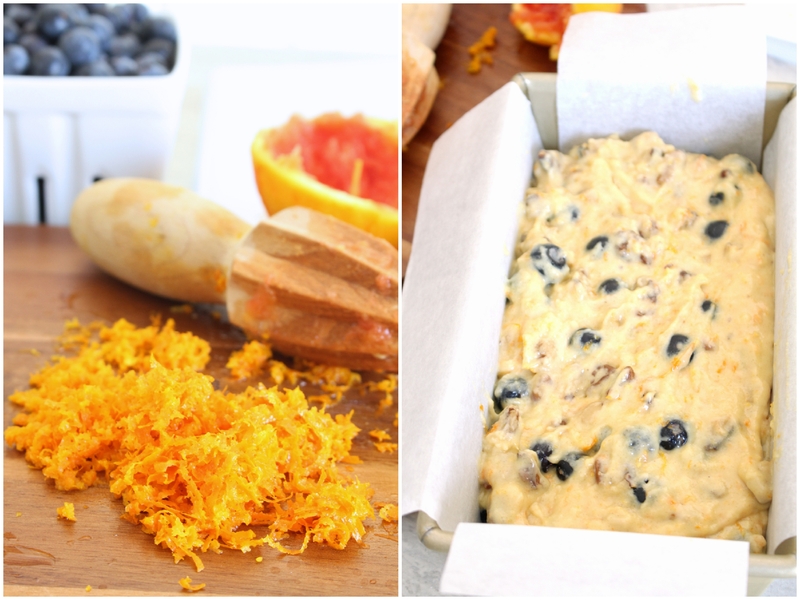 The orange zest and juice is a delicious addition to the bread and the flavor really stands out the following day. I found the batter was too dry and used a quarter cup more of orange juice than she calls for in the recipe. I used Cara Cara oranges in the recipe and was pleased with the outcome. Cara Cara oranges are less acidic, making the flavor sweeter. They also have a beautiful pink-orange hue that reminds me of an ocean sunset. This loaf forms a beautiful crack in the top and an awesome crust that is light, crispy and delicious the day it comes out of the oven. The following day the crust was not as crispy but the bread still made a wonderful treat to have with my morning coffee. The loaf is full of juicy blueberries and walnuts so it feels like a nice healthy choice for breakfast…I mean, it isn’t but I feel better telling myself that. 1. Adjust rack one-third up from the bottom of the oven and preheat to 350 degrees. Line a standard loaf pan with parchment paper or cooking spray and set aside. 2. Wash the blueberries and completely dry with a clean towel or paper towels. Place berries in a small bowl and toss with a tablespoon of the measured flour. Set aside. 3. In a medium bowl, sift flour, salt, sugar, baking powder and baking soda. Set aside. 4. In a large bowl beat the egg with an electric mixer. Mix in orange juice and butter. 5. On low speed, add the sifted dry ingredients and beat until just mixed. 6. 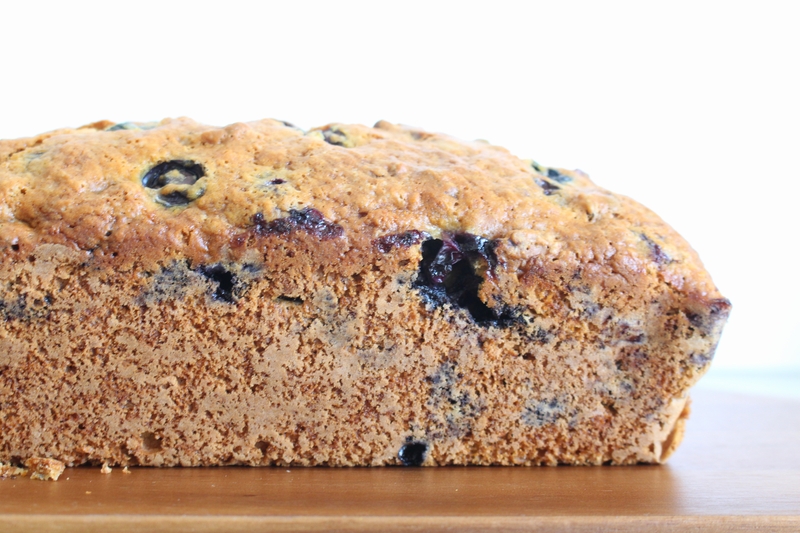 Gently fold in the blueberries and nuts by hand and place batter into the prepared loaf pan. 7. Bake for 70 minutes until a knife comes out clean and dry. Allow to cool in the pan for no more than 10 minutes to prevent a soggy crust from forming. 8. Gently transfer the loaf to a cooling rack and allow to cool completely before slicing. 9. Store loosely covered at room temperature – if it lasts that long! This entry was posted in Breads, Cakes & Cupcakes, Other Desserts and tagged blueberries, blueberry, blueberry bread, coffee cake, orange. Bookmark the permalink. Love your pictures of this cake! Amazing results! Yum! 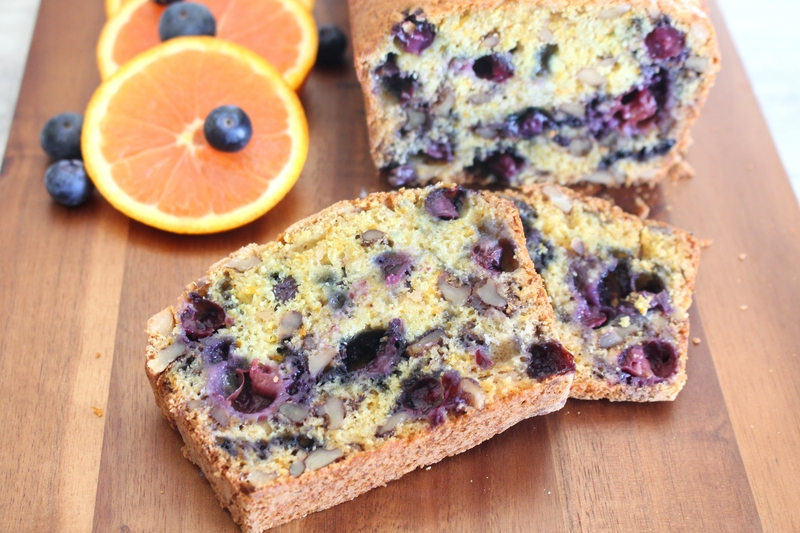 I love berries and citrus together and orange and blueberry sounds like an amazing combination! Your cake looks wonderful. I was really pleased with the way this one turned out. I was going to make this but I’ve been wanting to try Madiera Cake for ages. This one looks great and I’m loving the sound of cara cara oranges. Thank you so much! I have been too – can’t wait for the season to start in a couple months! Baked up to perfection! A perfect pair with coffee! Nicely done Jolena!